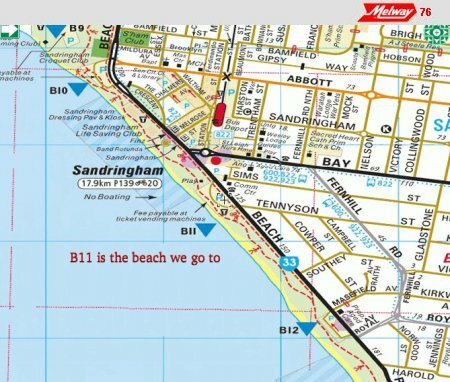 Folks - including the lovely sarahs_voyage, who is soaking up heat before she heads back to England :) - are heading down to Sandringham beach tonight, unless the wind is scouring skin off. Company is welcome :) People should be there by 6pm, swim for an hour or so, then grab some takeaway on the foreshore reserve at the top of the cliffs near the Bay Rd/Beach Rd intersection. If you park at the carpark across from Tennyson St, its a couple of bucks until 8pm, usually by the time we get there the day time folks have headed off. Alternatively, you can park up Tennyson St. From that carpark looking out to sea, on the left there's a path and then a ramp leading down to the beach. We're usually within about 10m of the end of the ramp. The Air con in my department isn't working properly so it is warm here at work!!!! This page was loaded Apr 22nd 2019, 10:47 am GMT.